dum, da-dum, da-dum,- da-dum ….that’s a pretty steady heartbeat, right? We’re talking walking pace, you’re feeling calm, you’re neither stressed nor thrilled but you can’t complain, right? And when you listen to a Milky Chance song, you can’t really complain either, right? Blossom even opens with that steady heartbeat, dum, da-dum, da-dum. Get used to it, it doesn’t really go away. Every song on this album is at the same walking pace. And we’re walking straight down the middle of that road. In theory, I should like Milky Chance – a folk band with an electronic heart. On paper, we could be talking about Bon Iver, with a touch of reggae. 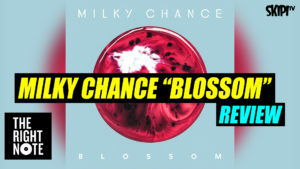 But Milky Chance, in an attempt to hold on to the organic sound of their first album, Sadnecessary haven’t managed to take the genre anywhere particularly interesting. Lead vocalist and guitarist Clemens Rehbein and DJ, producer Philipp Dausch, have known each other since school and got pretty lucky in 2013 when their song Stolen Dance became a viral hit. It was a surprising hit even for the duo who had been perfectly happy creating music in their bedroom studio and gigging at home in Germany. But instead of looking for greatness on their second album they’ve stayed exactly where they have always been. They recorded Blossom in almost the same manner as their first record. Sure, they’re mixing electronics with acoustic instruments, but a lot of their looped beats are coming from a toe tap or a clap in their attempt to retain that organic sound. The problem is, this album never really deviates from that steady walking pace. I can barely tell you of the merits of each song because they all sort of blend into one comfortable stroll.